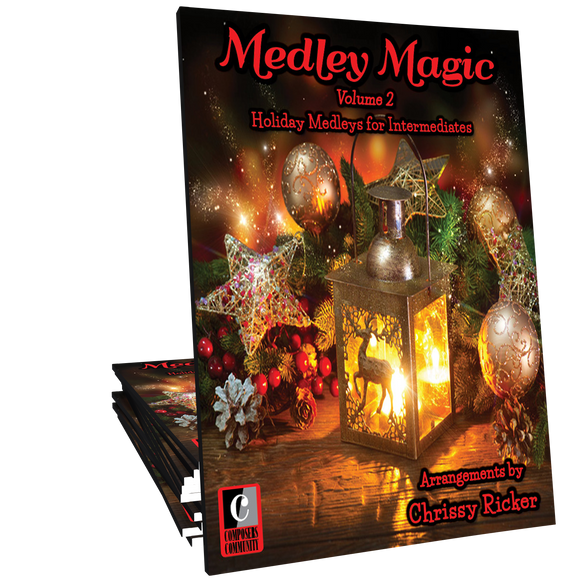 Medley Magic Volume 2 features nine artfully arranged intermediate solos that combine traditional holiday favorites with well-known classical melodies. 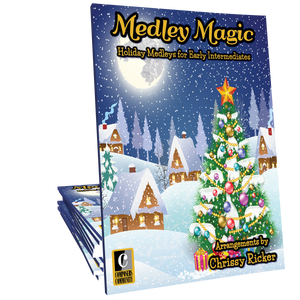 These showcase-style solos by Chrissy Ricker will be a hit at your next holiday recital! Chrissy, these are genius! I bought this one after I had already tried the first Medley Magic book, and I am blown away at your creative melding of the carols and the classics! I'm wishing my students were ready to play these already!!! Wow, these are brilliant arrangements. I love how the classical and Christmas melodies magically intertwine. I bought two copies of this book for two very picky intermediates who are fond of Mozart and Chopin AND Christmas music. These are so beautiful and so clever! I want one for myself now. Normally I am not a fan of "classical+(other music) mashups" but these lovely pieces have converted me! So, so much fun! Absolutely LOVE these arrangements! I bought it for one of my late intermediate student, but may have to get another copy for myself! Unique and very musical!! My new favorite!! So creative!! I’m always looking for new and different Christmas music- my myself and my students! We've loved Melody Magic in my studio..I'm so glad there is a Vol 2 now. Classic and Holiday together..what could be more fun. Love, Love, Love these pieces!!! I listened online recently, and purchased. Then, I printed and immediately went to the piano to play each piece. As I played, I could envision which student I had in mind to perform particular pieces. I think with the two medleys combined, we can start earlier than normal and they won't have to hear their family members say, 'Christmas music, already?' This Volume 2 collection is going to be so exciting for my more advanced students!!! My students really enjoy mash-ups and have particularly enjoyed putting Christmas and Classic Themes together. What I love about these arrangements much more than any others I've used previously, is their accessibility and adherence to both melody and style of the familiar pieces as they're put together. I'm so glad to have this collection as a new Christmas staple in my studio! I absolutely love these medleys! :) My students will be thrilled to have access to them through the hardcopy books. Thank you! These compositions are an exercise for the mind. It is a challenge to be able to play these songs they are like puzzles. It makes me want to combine two melodies and make them fit together. Fabulous arrangements! My students were thrilled to play Volume 1. I'm so excited to now have Volume 2! These are wonderful arrangements!